This topic is particularly close to my heart. One of my dearest friends has a 2-year-old daughter who is a sufferer of Salicylate Sensitivity. Never heard of it? Neither had I. But my mission is to raise awareness of the impact food has on our health, so I have been investigating! Firstly, what are Salicylates??? They are a naturally occurring chemical present in a variety of fresh fruit & vegetables but they also exist in a synthetic form that is used in medicines, perfumes & preservatives (Salicylate Sensitivity). Secondly, what do they do??? They are present in plants as a means to prevent against disease, insects & harmful bacteria and act as a natural immune hormone and preservative. The list of food sources containing salicylates is extensive! It includes apples, avocado, oranges, tomato, capsicum, broccoli, almonds, honey, coconut oil. Food such as fresh meat, dairy and most grains have limited levels of the chemical and therefore form the core diet for a suffer. Can fruit and Veg really be that bad??? For some people they are. Healthy food is not healthy for you if it makes you sick! This is my experience with dairy, grains & nightshades – each and every one of us is different. The symptoms of Salicylate Sensitivity vary from mild to severe but can include headaches, bed-wetting, sleep disturbance & irritable bowl symptoms. As you can see getting a good dose of nutrients with limited fruit & veg is extremely difficult and causes my girlfriend a great deal of stress when it comes to ensuring the health of her daughter. It can be a chore for many parents to get children to eat vegetables at all, but when the options are limited to vegetables such as cabbage, brussel sprouts & asparagus….the task can be overwhelming. Now comes to the best part of my research……a kid friendly low salicylate recipe found at Cooking for Oscar! This site was created by Oscar’s Mum, Sandra, who has had to accommodate her son’s intolerance to Salicylates, Glutamates, and most artificial flavours, colours, preservatives and additives. Hope you enjoy! 1. If using wooden skewers, soak them in water for about 6 hours before cooking, or as long as you have time for. This helps to stop them from burning. 2. Preheat the grill to medium-high heat. Line a baking tray with foil. 3. Process the leek and chives in a food processor until finely chopped. Add the mince, pear sauce and salt to season then process until the mixture is like a thick paste. 4. Divide the mixture into 8 portions. Take a portion of the mixture, and use your hands to form the meat around each skewer into a sausage-like shape. Place on the prepared tray and prepare the remaining koftas. 5. Brush the koftas with a bit of oil and place under the grill for 5 – 8 minutes, turning so it cooks on all sides, until just cooked through. 6. 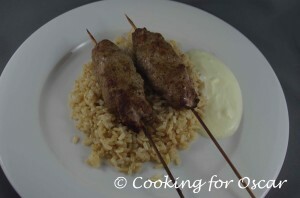 Serve on a bed of brown rice with saffron yogurt. Sending your child to school or care for the first time when they suffer from severe food allergies can be a daunting experience. You are literally putting your child’s life in someone else’s hands. The harrowing story on 60minutes at the start of the month had me in tears (it was the same week as my daughter’s anaphylactic episode). Leaving your child is not only confronting for you but a huge responsibility for your child’s carer! Careforkids.com.au is a fantastic resource for both parents & child carer providers that provides information to parents on the training and education that childcare providers have received and a list of information you should provide to them so they can best care for your child. ASCIA was recommended to me by a dietitian and as I investigated their website I found they have 3 dedicated e-training programs specific to school & childcare, the community & health professionals. The programs were released in 2010 and aim to provide ready access to accurate and consistent anaphylaxis education throughout Australia and New Zealand at no charge. There is support and quality information out there if you go searching (there is also alot of crap), I hope that I can sort through some of it for you and link you to quality research and information! I will be sure to take a pic of Evie’s first day of childcare tomorrow….with smiles all round and no peanuts in sight! When my daughter’s allergy was diagnosed, I felt completely left in the dark. I was handed a script for an epi-pen…and that was it! It was only through discussions with others that I was aware that I needed to get an action plan drawn up for childcare…so I asked for that – and that was it. I left feeling scared. I had no idea what this meant, how to determine what would be safe for her or where to go for support (hence why I started this blog). For anyone suffering from allergies I encourage you to visit Allergy & Anaphylaxis Australia they are a trusted charity for allergy support and I have found great information through their site.